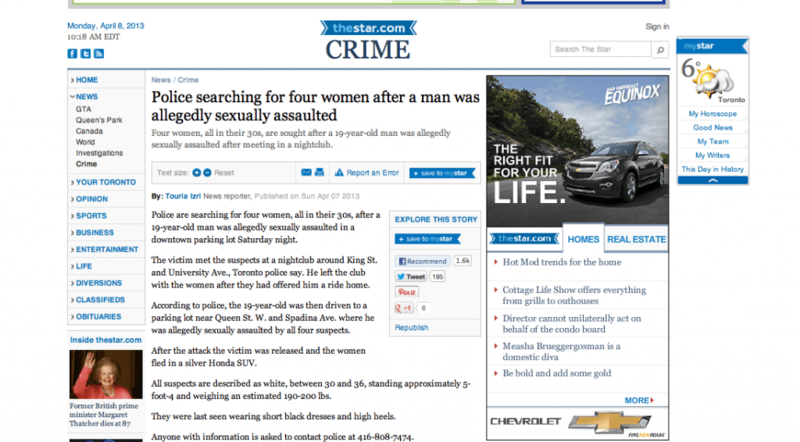 According to The Toronto Star, police are looking for four women in their 30s who allegedly sexually assaulted a 19 year-old man downtown yesterday morning. The fact is that sexual assault is about power. Though this type of assault is more commonly perpetrated by men, it is important that all victims feel safe and supported coming forward to report an assault. Every one of us has a right to maintain personal boundaries with regard to our bodies regardless of gender. For those commenters who feel it is appropriate to comment on the alleged perpetrators’ weight, quit your fat-shaming. The negative impact of assault is not mitigated by weight, age or beauty. I hope that my readers, friends and followers will think twice before using sexist “humour” to further attack a victim of sexual assault.